Sociological and psychiatric studies on suicide based on Western ideas about human nature see suicide as social or individual disorder. Suicide in China, however, should be understood differently. By analyzing 30 cases, Wu Fei studies the dynamics of suicide in terms of family politics and local psychology and finds that suicide is committed when a power balance is broken in the games of power in the family. Unlike public injustice, domestic injustice is not only closely related to, but also often strengthened by emotional interdependence. Suicide and depression are different responses to the same situation of domestic injustice. The book also covers suicide as perceived by rural people outside the family; how suicide is viewed in politics; suicide prevention and studies of suicide in Chinese modern intellectual history. 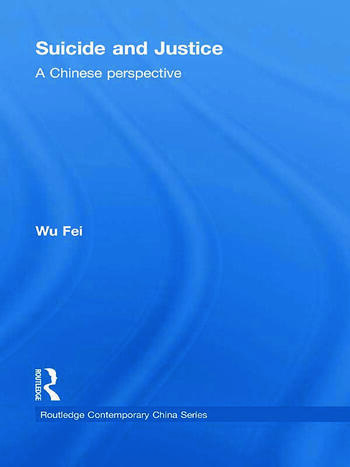 Showing that suicide in China is not mainly caused by too traditional values, but reflects a dilemma in Chinese modernity, this book should be of interest to students and scholars in Chinese studies; sociology; anthropology and suicide studies. Wu Fei is an Associate Professor in the Department of Religious Studies, Peking University.